Trumbull native Harold Jensen, a member of Villanova’s 1985 national championship team, poses with his plaque on Nov. 8. STAMFORD — A new era began for the Fairfield County Sports Hall of Fame when it re-opened on Nov. 8 at its new home at Chelsea Piers Connecticut in Stamford. After 13 years of being displayed at UConn-Stamford, the Hall of Fame now will welcome more than a million people a year from the Chelsea Piers community to view the outstanding athletes and coaches that the county has produced. The Hall of Fame is overseen by the Fairfield County Sports Commission. 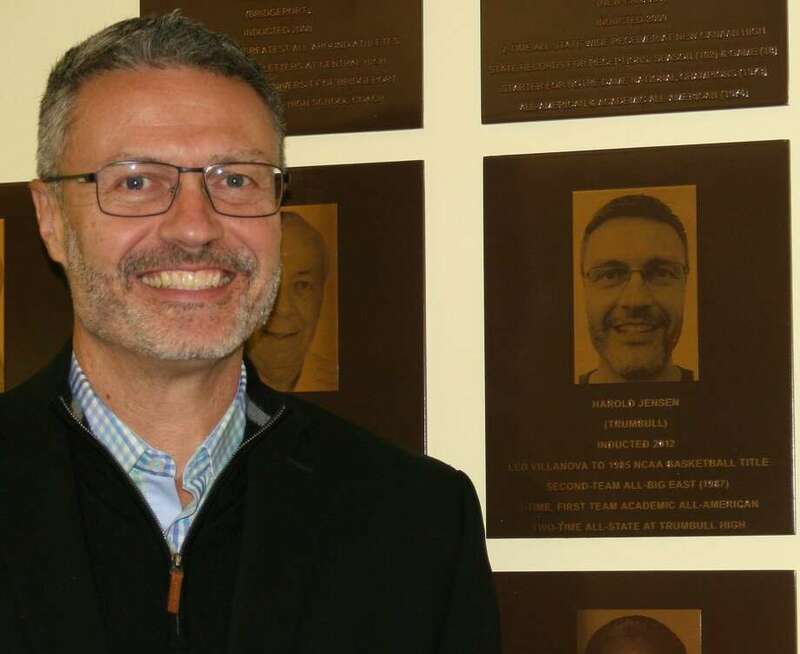 When the Hall of Fame needed a new home, Sports Commission executive director Tom Chiappetta knew Chelsea Piers was the perfect place. Both organizations hosted a pair of events at the facility to kick off their partnership. In the afternoon, 15 eighth grade students from the Rogers International School heard an educational talk from Chiappetta and Chelsea Piers’ Field House Director Jeff Brameier, the highly-successful Darien High boys’ lacrosse coach. A team building exercise followed as well as the students having a chance to see the plaques on the HOF wall. In the evening, the official re-opening was attended by Hall of Fame inductees, their family members and friends and supporters of the Commission. Attending were Hall of Famers Gary Liberatore (2008), Joe DeSantis (2011), Sue Merz, Wes Matthews and Harold Jensen (2012), Dennis Paglialunga (2013) and Laddie Lawrence (2017). Family members for deceased honorees Mickey Lione Jr. (2010) and Allyson Rioux (2013) were also on hand. Gregg Hutchings, a 2011 selection of the UConn Wing of the HOF, was also in attendance. In addition to the HOF, which has been sponsored by Aquarion Water for the past five years, the two groups also announced that as part of their partnership Chelsea Piers is offering the Commission $12,000 in Summer Camp Scholarships for the 2019 Summer session to be awarded by the Commission to the various youth organizations it supports throughout the county.